DETROIT – When engineers set out to make the all-new 2013 Cadillac ATS as light as possible they used advanced materials to minimize weight throughout the compact luxury sports sedan but never compromised performance capability. Lightweight parts such as an aluminum hood and magnesium engine mounts help ATS achieve a curb weight less than 3,400 pounds, and highway fuel economy well over 30 mpg. Keeping weight down also enabled balanced distribution of vehicle weight that helps delivers a world-class driving experience. One seemingly heavy way the ATS engineering team achieved its performance goals was using cast iron in the rear differential instead of aluminum, a learning taken from the performance-tuned CTS-V. The differential provides torque and rotation to the wheels, and ATS’s cast iron design helped distribute weight equally between the front and rear wheels to provide agile handling while reducing noise and vibration. Cadillac benchmarked it against world-class competition to deliver a driving experience that is as well-tuned for sound as for ride and handling. Unlike a differential made from aluminum, which expands and contracts twice as much in response to temperature change, a cast iron differential is stronger and retains its shape better under temperature extremes, which allows the ring and pinion gears to operate more quietly. As a result, a cast iron differential also requires less energy to operate, contributing to higher fuel efficiency. To the consumer, this means more miles between fill-ups. DETROIT – When engineers set out to make the all-new 2013 Cadillac ATS as light as possible they used advanced materials to minimize weight throughout the compact luxury sports sedan, but never compromised performance capability. Lightweight parts, such as an aluminum hood and magnesium engine mounts, help ATS achieve a curb weight less than 3,400 pounds (1,542 kg), and highway fuel economy greater than 30 mpg. They also enabled optimal weight distribution for a more balanced driving experience. One seemingly heavy way the ATS engineering team achieved its performance goals was using cast iron in the rear differential housing instead of aluminum, a learning taken from the performance-tuned CTS-V. The differential provides torque and rotation to the wheels. The ATS’s cast iron housing design helps distribute weight equally between the front and rear wheels, contributing to the car’s agile handling, while also helping reduce noise and vibration. 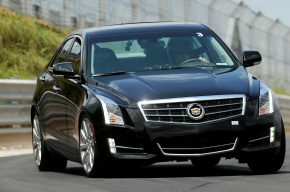 Cadillac benchmarked it against world-class competition to deliver a driving experience that is as well-tuned for sound, as well as ride and handling. Unlike a differential housing made of aluminum, which expands and contracts twice as much in response to temperature change, the cast iron differential is stronger and retains its shape better under temperature extremes, which allows the ring and pinion gears to operate more quietly. As a result, the cast iron differential housingalso requires less energy to operate, contributing to higher fuel efficiency. To the consumer, this means more miles between fill-ups. The ATS team also achieved significant weight reduction in the rear suspension by using specially engineered straight steel links, with lightening holes instead of using aluminum. ATS’s wheels also benefited from 50-50 mass distribution between the front and rear. While heavier cars need larger wheels, tires and brakes to account for heavier mass, ATS’s relative light weight enabled the use of optimized high-strength aluminum wheel forgings and Brembo brakes that deliver stopping distance of approximately 129 feet decelerating from 60-0 mph, which is expected to be best in the segment. Inside the ATS, the vehicle team took advantage of a new process that places sound-absorbing material between two layers of laminated steel. By doing so, Cadillac refined a part and process it pioneered on CTS. These sound-buffering materials help reduce noise coming into the cabin from the powertrain and fine-tune the sound to a sporty growl that communicates powertrain response and road characteristics to the driver.ATS also uses an acoustically laminated windshield and side windows that are lighter than standard tempered glass and provide better wind and powertrain noise reduction, for a quieter interior. Acoustically laminated glass also offers almost double the amount of ultraviolet ray protection. “Smart material selection and styling modifications that reduce complexity are key enablers in our quest to reduce vehicle mass,” said Bob Boniface, Cadillac exterior design director. “As consumer demand for more features, space and comfort continues to increase, so too has our proficiency in designing vehicles that offer aerodynamic performance and efficiency equivalent to lower vehicle weight,” he said. The ATS, which starts at $33,990, goes on sale this summer. The Cadillac ATS luxury sport sedan, which goes on sale this summer, features lightweight parts such as an aluminum hood and magnesium engine mounts to help ATS achieve a curb weight less than 3,400 pounds, and highway fuel economy well over 30 mpg. When engineers set out to make the all-new 2013 Cadillac ATS as light as possible they used advanced materials to minimize weight throughout the compact luxury sports sedan but never compromised performance capability. The ATS team also achieved significant weight reduction in the rear suspension by using specially engineered straight steel links with lightening holes instead of using aluminum. These sound-buffering materials help reduce noise coming into the cabin from the powertrain and fine-tune the sound to a sporty growl that communicates powertrain response and road characteristics to the driver. ATS also uses an acoustically laminated windshield and side windows that are lighter than standard tempered glass and provide better wind and powertrain noise reduction for a quieter interior. Acoustically laminated glass also offers almost double the amount of ultraviolet ray protection. “Smart material selection and styling modifications that reduce complexity are key enablers in our quest to reduce vehicle mass,” said Bob Boniface, Cadillac exterior design director, who spoke Thursday during a panel discussion on lightweighting at the Automotive Press Association. “As consumer demand for more features, space and comfort continues to increase, so too has our proficiency in designing vehicles that offer aerodynamic performance and efficiency equivalent to lower vehicle weight,” he said.